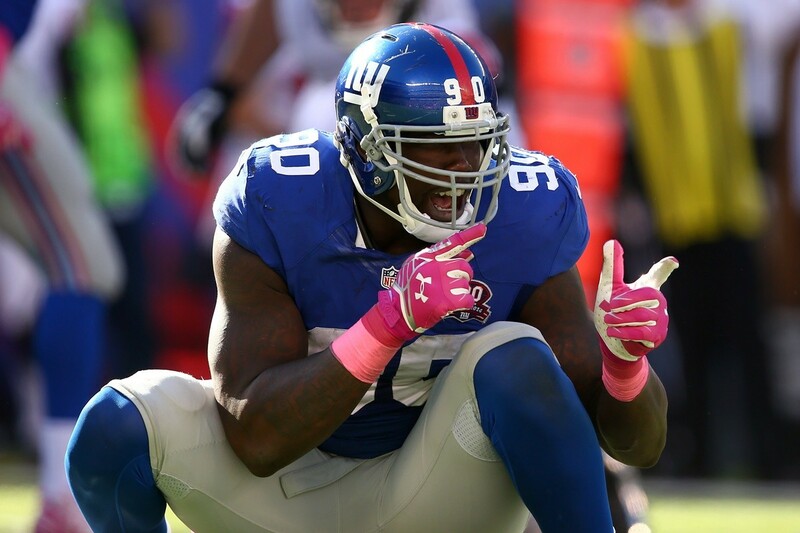 New York Giants defensive lineman Jason Pierre-Paul was one of the biggest stories of the off-season, but not because he did anything criminal or sign a new mega-contract. The big man was celebrating the Fourth of July like many people do, with fireworks. Somewhere along the way something went wrong and he ended up severely damaging one of his hands. When all was said and done he ended up having to get his right index figure amputated. Drama between Paul and the Giants ensued. Team representatives tried to see him in the hospital but he turned them away. He had been previously hit with the franchise tag meaning he had a one-year, $14.8 million dollar on the table, but like most free agents he wanted a multi-year deal. Prior to his accident he had a five-year, $60 million deal on the table, but the team pulled it after the accident. However, the team did not pull the franchise tag contract, one-year for $14. Million, and he finally signed it on Tuesday. The contract is for one season, but since he was not under contract until Tuesday he does not get paid for the first seven weeks of the season. Had he not signed the deal when he did he would have lost another $870,000 (1/17th of $14.8 million). So as it stands he has lost at least $6.1 million because of his fireworks accident. Rumor has it that his deal is heavy with incentives, and his guarantee has been reported as being low. Should he perform over the remainder of the season he still stands to make as much as $8.7 million. It remains to be seen whether he will lose more money because of the accident. When the season ends he will become a free agent again. It all depends on how well he plays when he finally gets back on the field. Team officials have said they are happy with his physical condition, but working out at home like he has been will not get someone in playing shape. The team is expected to let him do just that over the next three weeks in hopes he will be ready to go in Week 12 against the Washington Redskins. Assuming he is, he will have six games to show what he is worth. Can he do enough in just six weeks to earn a multi-year deal? Maybe. Last season he only had 3.5 sacks through the first 11 games, but made nine sacks in the last five. Should he have a similar end to the season this year maybe the team will still feel like he is still the same guy and sign him to a high dollar, multi-year deal similar or greater to the deal they had on the table prior to the accident (five-year, $60 million). However, it would also not be surprising if they wanted to see more before making such a large investment in a player with an injury as unique as his. Should that be the case he is going to end up losing a lot more than $6.1 million for playing with fireworks. As another NFL season comes to a close, let's take a look at some of the incentive bonuses players captured – and a few that slipped right through their fingers. It isn't a surprise is how well paid many NFL players are. Teams will go out of their way to ensure that their top players remain with their franchise and aren't lured away to their rivals.